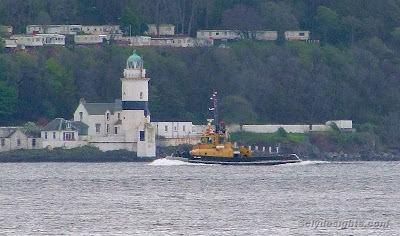 Seen from a distance, this view shows the new Serco Denholm tug SD MARS arriving on the Clyde for the first time this morning. The first vessel destined for the Great Harbour as part of Serco's major fleet renewal programme, she was built in Holland by Damen Shipyards at their Gorinchem yard. SD MARS, which will replace one of the 'Dog' class tugs SD SPANIEL, arrived at Portsmouth earlier this month to be prepared for her voyage north. Built to the Stantug 2608 design, she is 26 metres long and 200 gross tons. Fitted with twin conventional screws, she also has a bow thruster to aid manoeuverability. She is to be joined by a sister, named SD JUPITER, in July.